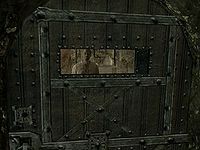 Before leaving, however, Esbern will scamper about his room, claiming that he has to remove any sensitive information the Thalmor may discover. He will also gather some supplies from the chest at the foot of his bed and then will be ready to leave. The quest ends here and the next quest, Alduin's Wall begins. Once you have located Esbern's place, a Thalmor team is sent to the entrance of the Ragged Flagon. Leave the Flagon from the front door will trigger an event as Thalmor talking about your efforts. If you decide to return to the Flagon, you will see them enter the Flagon, intimidate for your location, and finally, leave the flagon.